Earlier this fall, we covered an exciting drag race between a heavily modded previous-gen Ford GT and a bone stock McLaren 720S. The GT had some 1,000 horses (1,014 PS / 746 kW) at the crank and an impressive 890 hp (903 PS / 664 kW) at the wheels. Behind the project, said to have cost in excess of $40,000, lies Heffner Performance, a Florida-based tuner specialized in modifying high-end exotics. Scrolling through their site reveals two distinct upgrade packages aimed at the previous-gen Ford GT. Stage 1 lifts the output to 975 hp (989 PS / 727 kW) at the crank, and 850 hp (862 PS / 634 kW) at the wheels on regular 93 octane gas. On racing fuel, the numbers increase to 1,150 hp (1,166 PS / 858 kW) and 1,000 WHP (1,014 PS / 746 kW), respectively. This will set customers off $35,000, or $42,000 with the titanium intake and exhaust plumbing. Stage 2, on the other hand, significantly transforms the American supercar by giving it in excess of 2,000 horsepower (2,029 PS / 1,492 kW). And that’s at the wheels (!) and not at the crank. Modifications include a reinforced chassis too in addition to the heavily tuned, twin-turbo engine, and the model is said to be street-legal as well as an absolute beast in 1/4-mile and 1/2-mile drag racing. Finding out how much it costs to make your Ford GT a lot more powerful than the Bugatti Chiron requires contacting Heffner Performance. As for those who might think that 2,000+ WHP is overkill, well, the tuner does have other parts in store that should suit pretty much every owner’s needs. 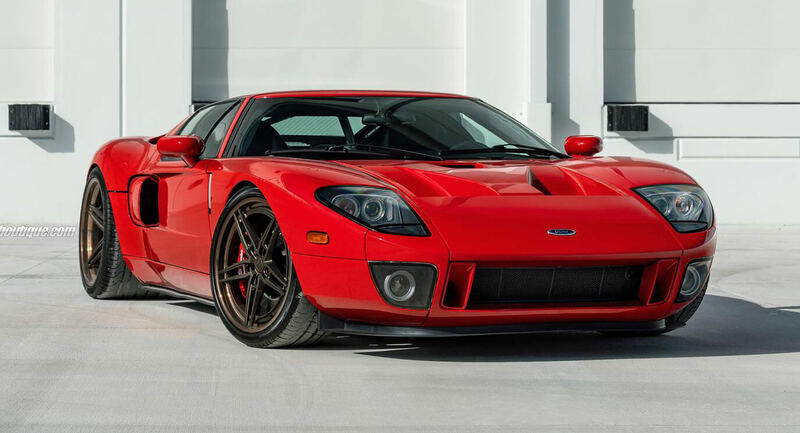 And the rest of us mere mortals, who will never be able to afford a Ford GT, let’s take a closer look at that example unleashed at the drag strip earlier this year, only this time in an image gallery, shared by WheelsBoutique on social media.